There was a woman I once new at the University of Illinois, a fraternity brother's steady girlfriend who I became regular study partners with as we fought to close out our grueling final year in electrical engineering. She was smart, funny, sweet and kind, a joy to be around, and also quite beautiful, but given that her beauty came in a quiet, classy, polite package (not to mention taken), she often found herself bypassed at parties by fraternity brothers of mine for whom qualities such as smarts, humor, sweetness and class were not of immediate primary interest. So one night, at one of the biggest parties of the year, without saying a word, she shows up wearing nothing but slacks and a form-fitting, clear plastic top. I'm not talking somewhat revealing here. I'm talking one hundred percent transparent. Needless to say, none of us saw or treated her in quite the same way again, and when I finally asked her about her motivations months later, she answered matter-of-factly, "Everyone just saw me as so-and-so's sweet little girlfriend, and I was tired of being pigeon-holed and ignored. There's so much more to me than that!" 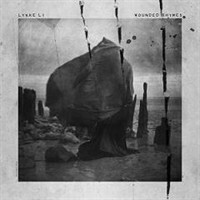 Lykke Li's sophomore LP Wounded Rhymes feels born of the exact same female frustrations and intent. Five years back, at the age of nineteen, the precocious young Swede began releasing spare dance-pop singles, finally aggregated in her 2008 full-length debut Youth Novels , that were striking in their emotional intimacy. Tracks like Little Bit and Dance, Dance, Dance conveyed a sense of naked vulnerability few artists could match, and that shy, awkward vulnerability soon became the only talking point associated with her music. But anyone who has seen Li live knows she is actually amongst the most searingly intense performers on the present-day concert circuit, a force to be reckoned with. Enter Wounded Rhymes to set the record straight. From the outset, with the hard-charging stomp Youth Knows No Pain, one senses vulnerability is not going to be a defining aspect this time around. By the time one reaches the album's fifth track, the sexually dominating Get Some, where Li declares (in the year's most quoted lyric) "Like a shotgun / needs an outcome / I'm your prostitute / you're gonna get some" it's a certainty. Though she's still exploring moments of high emotional turmoil, commitment, and disappointment here, only on the haunting, desperate I Know Places does Li return to Youth Novels' trademark intimacy. Otherwise, Wounded Rhymes is as much of a radical departure musically as it is lyrically. Where the stylistically varied debut was stark, gentle and restrained, Rhymes is lush, tough and explosive, locked in on a musical palette that pairs 60s-flavored garage rockers and Brill/Doo Wap/Spectorian ballads in equal measure with all manner of exotic, sampled, thoroughly modern percussion. Listening to the bouncing ping pong balls that open Youth Knows No Pain, one imagines Lenny Kaye's Nuggets compilation, Spector's A Christmas Gift For You , and Flying Lotus's Cosmogramma may have been the only albums Li and producer/arranger Bjorn Yttling (of Peter, Bjorn, & John) allowed during breaks in the recording sessions. Throughout on this exceptionally consistent effort, Li emerges as a far more forceful singer and presence than ever before, demanding attention. Even tracks with a decidedly downbeat sentiment, like the Carole Kingish Sadness Is A Blessing, have a triumphant swagger to them. In truth, I probably still like the in-most-ways inferior Youth Novels better, so great were those high points and moments of intimacy, but by any measure, Wounded Rhymes is a remarkably confident and assertive stylistic shift for such a young artist, and seems destined to become one of 2011's signature albums. "What else have we failed to see in Lykke Li that she is yet to reveal?" Cherry Picker's Best Bets: Get Some , Rich Kids Blues , Sadness Is A Blessing , I Know Places . Here's the official video for the assertive Get Some (a bit inappropriate for younger viewers). What are your thoughts on Lykke Li's Wounded Rhymes? Let readers know!